Father of Eren and foster father of Mikasa. He is a renowned doctor who was well respected in the District of Shiganshina after he saved the village from a mysterious viral epidemic by developing vaccines. He also provides a medical house call service to the people of Shiganshina and to various towns in addition to having a network of contacts within the Corps of the Shiganshina district. 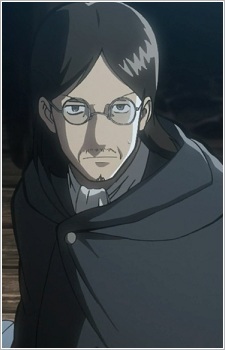 In the basement of the Yeager family house he hides a secret which he refers to as the "truth" and upon meeting Eren after the fall of the Wall Maria in the year 845, injects him with a series of chemicals and amnesiacs and entrusts him with the key to the "truth", before disappearing. Note: Grisha Yeager is the official English translation by Kodansha.